Product prices and availability are accurate as of 2019-04-06 00:56:13 EDT and are subject to change. Any price and availability information displayed on http://www.amazon.com/ at the time of purchase will apply to the purchase of this product. The Industrial 56" ceiling fan is durably constructed for industrial, commercial and residential applications. Well-recognized for its modern, mechanical appeal, the Industrial fan needs minimal assembly and includes a five-speed wall control unit and a clean white finish. Meant for cooling larger work and living spaces, such as workshops, lofts and high ceiling great rooms, the Industrial ceiling fan must be hung at least 10 feet above the floor. High performance motor provides excellent airflow of 7,105 CFM and airflow efficiency rating of 113 CFM/W, using only 63 watts of energy on high speed. 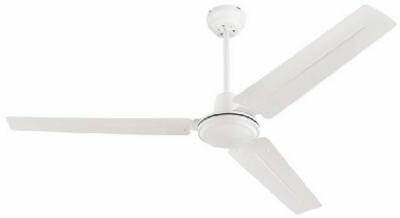 56-inch indoor ceiling fan with three blades 3 aerodynamic curved metal blades 172-by-12-millimeter cold-rolled steel motor with single capacitor for powerful and quiet air circulation Five fan speed wall control for customized comfort. Finish Details White steel blades Versatile white finish. Installation Ideal for rooms up to 360 square feet (18 by 20 feet) Must be hung at least 10 feet above the floor Not recommended for use in household applications Includes 1/2-inch by 12-inch down rod, 54-inch lead wire, five-speed wall control unit, and ball-hanger installation system. 56 in. Industrial white finish ceiling fan 3 aerodynamic curved metal blades 12 in. Down rod & 5 speed wall control Fan required to be 10 ft. Above floor Dimension - 9.1 x 8.5 x 28.7 in.